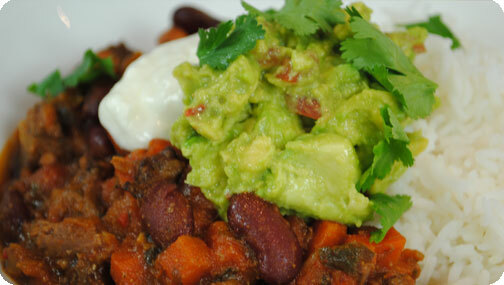 Chilli Con Carne with Guacamole, Sour Cream and Basmati Rice – 483kcals and 15.3 of fat per serving. Preheat the oven to 160°C. Heat the olive oil in a large casserole, then cook the meat in batches until it is nicely golden-brown all over. Remove the meat with a slotted spoon and leave to the side in a bowl. Throw the onions, carrots and celery into the pan and cook on a fairly low heat for 15 minutes or until the vegetables have softened and gone slightly golden. For the last 2 minutes of cooking add in the garlic and the chilli. Stir in spices and cook for 30 seconds then the tomato purée and cook for another minute. Add the bay leaves, thyme, parsley, stock, tomatoes and half the basil. Pop the meat and all of its lovely juices back into the pan. Give it a good stir, then put the lid on and place in the oven for 2 hours. You want the meat to be really soft and the sauce to thicken and become rich. Stir in the red kidney beans and cook for a further minute until it has thicken and become really rich. Leave the casserole to rest outside the oven for 10 minutes, then go into it with two forks and shred the meat to bits. If the meat is cooked properly, it will break up as you squish it a little with the back of a wooden spoon. Stir in the red kidney beans and cook on the hob for five minutes or until cooked through Serve topped with a dollop of guacamole and with basmati rice. To make the guacamole, mush up the garlic and the chilli into a mortar or a small bowl. Add the rest of the ingredients. With the pestle or the back of a fork mash the avocado until its smooth with a few chinks. Pour over the lime and salt and mix together, then add the rest of the ingredients and stir.